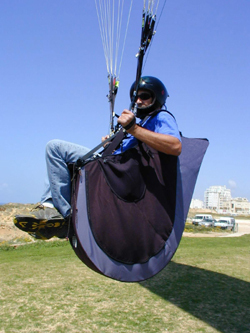 The Finesse Plus Cygnus Airbag is a unique harness on the paragliding market. 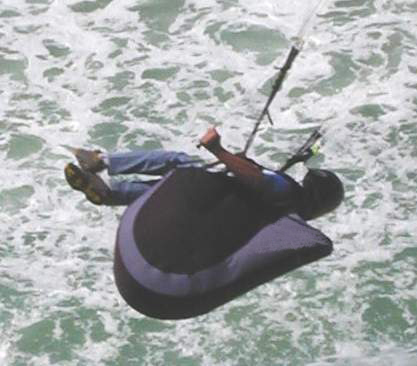 It offers immediate protection at Take-off (long before the standard cygnus type harnesses). This is because the airbag is kept inflated by a Lexan sheet before taking off. Once airborne, the Airbag is further pressurized by a large Air-Mesh Intake Valve, Giving it a very high internal pressure. The Finesse Plus Cygnus Airbag harness shares an additional pilot protection system with the original Finesse and Finesse Plus. This protector is based on a sheet of Lexan which forms the outermost layer of protection. This layer spreads the load onto the internal foam airbag protector (optional), in addition to this, the protector gives the harness a superior aerodynamic form in flight. The side mounted reserve parachute container, which doubles as side-inpact protection on the right hand side (reserve parachute sold factory installed as an option). The left hand side features yet another new product - the Polysterine side impact protector (optional). This protector offers superior protection while giving a significant reduction in weight.